With 16 days of classes remaining at Hermon High School before summer vacation, Elizabeth “Betsy” Trenckmann’s science lab looks lived in. And learned in. Drawings of food webs and the Coriolis effect decorate walls and cabinets, as do the words “Science,” “Investigate” and “Think” spelled with element symbols from the periodic table. Large handmade paper die for science games had been tossed on a sideboard near a glass aquarium that’s home to a gecko named Otis. A class planner and end-of-the-year teacher checklist are on top of Trenckmann’s desk. So, too, are a small jar of peanut butter, a few cheese puffs and a mug of tea — fuel to snag in a free minute between back-to-back-to-back courses. In a late-morning Earth Systems class, Trenckmann’s energy level matches that of the first-year students perched on stools around six high octagonal stations. She prompts, encourages, jokes, prods and asks questions as she walks around the bright second-floor room in the modern two-story brick school. Trenckmann easily transitions from giving a short lecture, to facilitating small group work, to leading a review about carbon atoms. 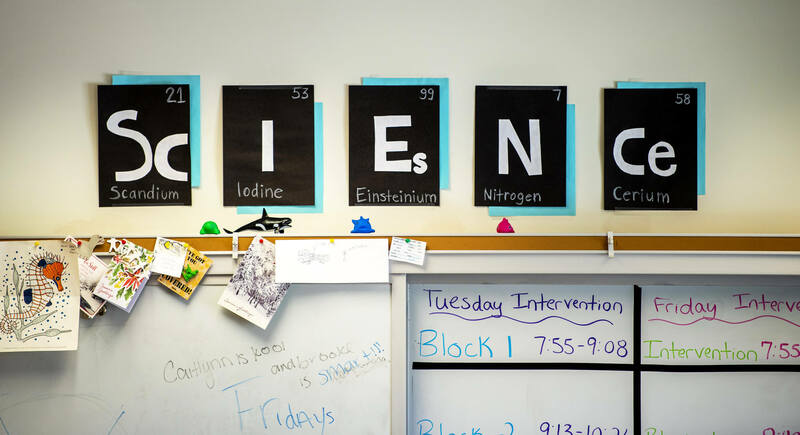 In Betsy Trenckmann’s classroom, “Science” is spelled with element symbols from the periodic table. She then simultaneously sets up and explains an experiment with a heat lamp, plastic soda bottles half-full of water and Mentos to demonstrate how greenhouse gases raise Earth’s temperature. Trenckmann, the Maine Center for Research in Education’s (RiSE) 2017 Outstanding Master of Science in Teaching Student at the University of Maine, says being a first-year teacher is the most difficult and single most rewarding thing she has ever done. Prior to earning her MST in spring 2017, the Colorado native secured the job at HHS. At the school with approximately 520 students, Trenckmann teaches four sections of Earth Systems for first-year students, one section of Conceptual Biology for sophomores and one section of Ecology of Maine for juniors and seniors. One of Trenckmann’s biggest challenges: balancing lesson planning and grading with sleeping and having a life outside the classroom. “I’ve had to spend a large amount of time developing lesson plans or reworking lessons left from previous teachers,” Trenckmann says, adding on a few occasions she’s tossed her well-thought-out plans and adjusted on the fly. “I would go into a lesson thinking the students would love the activity and that would not be the case, which required a lot of adapting and changing in the moment,” she says. The rewards, she says, are numerous, and include receiving support from her teaching colleagues at Hermon and building relationships with each student. “It’s gratifying to see how excited they get after they have aced an exam they prepared for, and see the growth in individual students from the beginning of the year,” she says. Trenckmann credits the RiSE Center’s MST program with preparing her for challenges of a first-year teacher. Trenckmann wants to inspire students just as her teacher Rita Kasper did at La Veta Junior-Senior High School in Colorado. “I believe I still have a long way to go … but that just gives me something to continually strive for,” she says. Juniors and seniors completing a marine ecology unit in Maine Ecology lauded the course, the hands-on learning and Trenckmann. Juniors and seniors in a Maine Ecology class play Jeopardy to prep for a marine science exam. “This is one of the best classes I’ve taken at school and the teacher is a big part of that,” says senior Gil Dor, after shining in an Ecology Jeopardy game. “I find when I’m engaged, it doesn’t feel like studying.” Dor plans to attend Unity College and perhaps major in wildlife biology. Senior Paige Linehan, who says she intends to enroll at UMaine (and has), says the knowledge she’s gained has made her more environmentally conscious. Another student says she’s stopped using plastic straws at restaurants because of what she’s learned about the impact of plastic on oceans and marine life. “I have seen little glimpses of students getting the ‘aha’ moments and students telling me I am their favorite teacher, which also help motivate me on this path to becoming an inspirational and motivational teacher,” Trenckmann says. The RiSE Center still helps her do that. 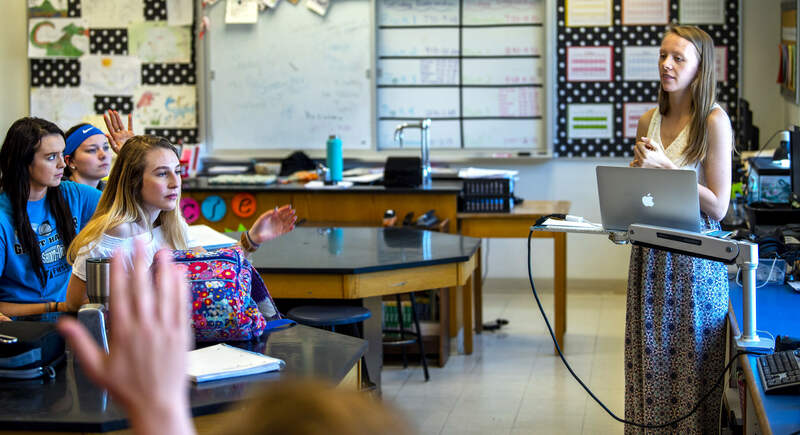 At UMaine, Trenckmann earned a Noyce Teaching Fellowship from the National Science Foundation that sustains her professional development and examines keys to teaching success in rural schools. “It’s continued to provide me support during my first year of teaching, and the classmates I had during this journey have been the first I turn to for advice and guidance — as they are going through the same things as me,” she says. During the hectic school year, Trenckmann is excited for summer … to continue teaching. She made plans to be in Fort Pierce, Florida to be a marine biology educator and help run the Smithsonian Marine Ecosystems summer youth camp.